SS goes on to claim that Paul’s conversion is evidence. He claims that since the people around Paul heard something, it means it’s true. Again, nothing says that the story is anything but a story. We also have Paul tell the story several times but getting the details different. That is apologized for by saying it was “tailored” to an audience, but what about saying someone only heard something and and then saying they saw something too is “tailored” not to use for everyone? SS also claims that the citing of JC by supposed 500 people is true. Again, no evidence of this at all, just a story like the claims that JC did so many works on earth after his death and resurrection that the “whole world” could not contain them all. Our poster claims that the information about this citing was “probably” well known, but presents no evidence to support this claim. SS claims that Paul is “likely” mentioning this because they already know it. It’s amazing on how much Christians can claim to know about what people 2000+ years ago are thinking when convenient. Really? This man supposedly did miracles in front of them. He *said* he would be killed and rise in three days (Mark 8, Matthew 17, Luke 9, for starters. Then you have all of the parables and analogies which many Christians accept as directly about the resurrection) , and in the bible, all of them, except for maybe Peter with his denial of knowing JC, and Thomas who was made an example, were not claimed to have doubted (if indeed one can believe the bible). And now WLC, and evidently Ben and SS, want us to believe that the apostles were amazingly stupid and did not believe in what this Jesus when it is convenient for WLC, Ben and SS. I’m just waiting for a Christian to pipe up and say “but but Vel, you’re talking about them if they were real people,and you spend so much time on the bible, so that must make them real”. Heh, yeah, sure. 🙂 Oh yes, and the claims that since JC predicted his death, and then supposedly died *just like he said*, that this must show that the resurrection is true too. Again, no, we only have stories, no evidence. We can have stories that predict all sorts of things, Cassandra was right about Troy, and the oracle of Apollo was right about Perseus killing Acrisius. Not hard to make prophecy work when the whole thing is fiction. It’s also rather amusing when SS tries to claim that the people in 1 century CE couldn’t have possibly extrapolated the idea of a one-time resurrection from the common resurrection myths in the area. He also forgets that one time resurrections weren’t that uncommon. Heracles, Osiris, Asclepius (a god of healing), good ol’ Mithras, etc. But ignorance, willful or not, of other religions and myths is common to many Christians. We get the claim that if he appeared to skeptics, he must have existed, but we don’t know these people were skeptics at all or if they aren’t just characters in a story. Again, we only have stories. We get the claim that since the apostles were extremely devoted to their religion, that means it was true. Well, I’m sure that will make the people at the People’s Temple, the Heaven’s Gate believers, the Cathars, etc very happy since by this argument, all of their beliefs were just as true as Ben and Silverswiper’s beliefs. Sincereity about a belief does not mean that belief is true, only that they person thinks it is. SS also tries the ol’ claim that the events in the bible have ot be true since the apostles were willing to be martyrs for those beliefs. Again, I’m sure that the folks who died at People’s Temple, Heaven’s Gate, the Cathars, Jews, etc would appreciate that sentiment since that means their beliefs are suddenly as true as our Christians believe theirs are. And that last with the Jews’ beliefs being as true as Christians are, well, that does present a problem with who the messiah actually is. Because they don’t believe that JC was the messiah. Let’s finish by looking at the belief in a popular supernatural figure. 2. There are sincere believers in him. 3. There are events claimed to happen because of only his action. 4. There could have been or was a regular human who could have been a kernel around which the legends coalesced. Jesus Christ? Yep. And Santa Claus. I left a much longer reply on another thread. I would suggest, politely, that you read it. My training is in Greek and Roman history; I read Greek. I’ve read Josephus. I’ve read Eusebius. The arguments are not nearly as facile as you present. Nothing has been ‘proven’ about any of this, because none of it can, truly, be ‘proven’ in any meaningful sense of the word. Historical arguments are arguments of probability; the farther back you go, the fewer actual facts you have, so the greater the reliance on probability. However, Jesus’ existence in no way implies his divinity. The first is verifiable (theoretically, at least); the second is not. These are two entirely separate and distinct arguments, and you need to be very clear on this. I hold the first to be true; what I believe about the second is entirely irrelevant. “Christ” is simply the Greek translation of Messiah. Josephus was fluent in Greek; he certainly knew what the word “Christos” meant, so please take some care with your argumentation. And, btw: Santa Claus–aka Sinter Niklaus = St Nicholas–did exist. Or, at least, it’s very likely that he did. He is also verifiably a saint. But, whether he had supernatural power to perform miracles is, again, a matter of faith. Yes, St. Nicklaus did exist. Did he have magical reindeer? No? Then it’s not the same character. Just like Jesus Christ son of God is not Jesus, the non-magical Jew. I’ll be back later to address your other points. Let me be clear about this. I am making no claims that anyone had non-natural powers. What I am saying is that, at one time, both Jesus and the man who came to be known as Saint Nicholas were real, live, flesh-and-blood human-type people. Full Stop. Can I be any more clear? Hi James… Granted, i’m not expert, but I’ve seen a number of lectures where it was asserted Josephus couldn’t have used the word “christ” as it was a 3rd century (Greek) invention. Regardless, the question would stand as to why he’d even use a Greek word. Josephus must be tossed out completely as any sort of ‘evidence.’ No court in any land would accept it, so that standard must apply. Sorry, not sure where you heard that about the word christos, but it’s a very standard, non-exceptional Greek word that means ‘anointed’. Which is what the Hebrew ‘messiah’ means. You can find christos used in the fourth century BCE, 400 years before Jesus was born. Any standard Classical Greek lexicon will bear that out. So, perhaps you misunderstood what was said. Because Paul called Jesus “ho christos” already by about 50 CE, about 20 years after Jesus’ death. When referring to “Jesus Christ”, the proper form would be “Jesus the Christ” because it’s a title, not a surname. Also, the Hebrew messiah was not considered a divine individual, but another standard-issue mortal, who became anointed, just as David was anointed as King per the story. Thanks for the clarification, James. Appreciated. Historical arguments can be considered arguments of probability, I agree. However, supernatural events, since having no proof of every happening, are of a very low probability. Does this mean there can’t be a god and a Jesus, a Zeus, a Krishna, etc? No, but the odds are truly against it. You are arguing for Russell’s teapot. We can say that since there are humans, are wars, are empires, then Julius Caesar is very likely to have existed; those are common events with 100% probability since they have occured. Since we have Julius’ writings, contemporary writers who mention him, coins minted in his name, inscriptions about him, then that adds to the high probability that he existed as a man; perhaps not exactly as history claims but as a man none the less. Then we have claims about divine figures, like Jesus, Krishna, etc. They, as the divine figures claimed, have little probability to have existed since we see no miracles, no supernatural effects at all. For existence, We have no contemporaneous writers mentioning Jesus, we have no one noticing the supposed great events around their existence. No one noticed the earthquake, darkening of the sun, the dead “saints” risen from their graves, healing of people, raisign of the dead, gathering a legion’s worth of men (not counting women and children) outside an occupied city, etc. Now, if the Jewish patriarchs rose from their graves, one would think that the Jews would have noticed and the Romans would have had their hands full if the Jews thought that their supposed great generals were back to lead them. It can be considered at least fairly probable that a male Jew claimed to be the messiah. This man is not the Jesus you and your fellow Christians claim existed. Since you cannot show that the magical JC existed, now you are only left with claiming that maybe someone that was kinda close existed. The arguments for a human Jesus and a divine Jesus are not distinct, they are very much the same since you want to claim that Jesus is the son of God and that everyone should join you in worshipping him. You aren’t asking us to worship a Jewish messiah-wannabee at all, your fellows aren’t insisting that the United States should be a Christian nation following Joshua Ben Joseph. And it’s not irrelevant at all about what you think about the divinity of Jesus. I think it’s quite relevant in that you are trying to pretend you aren’t a Christian. You cannot show that your supposed savior and the savior of the world existed. And for some reason, you think that the *possibility* that there was some man who thought he was the messiah should impress everyone. How many times do I have to say this? I am not talking about anything other than a standard-issue human being who lived and died. And stayed dead. Perhaps while he was alive, but certainly after his death, legends and then beliefs accrued which gave rise to a religion. Where have I claimed that Jesus was divine? I have not. I have said he was human, which you want to deny, and I believe that denying Jesus’ human existence is very bad historical thinking. It adds a huge wallop to your argument against his divinity, but it really ignores the historical process. What about Thomas Aquinas? Or Francis of Assissi? Both certainly lived, but as Catholic saints, they are credited with miracles. Can you assert their existence without agreeing that they performed miracles? I believe it’s entirely possible to say they lived without saying they performed miracles, whether when alive or posthumously as is often the case. Just so, I have not stated that the Jesus who lived was the messiah, was the christ, was the anointed one. I am saying he lived, and then stories were told about him. It is not necessary to admit that Jesus was anything but an ordinary man if you admit that he did live. His human existence and his divinity are completely separate, distinct, and different issues. I can argue his existence without suggesting anything beyond that. I have very deep suspicions about Josephus, but I am not quite convinced that the Christians invented the whole thing. If they did that, why not make the statement stronger and completely unambiguous? There was a man named Jesus, who was a wonder-worker. The rest is probably fictitious, but I am not convinced you can dismiss it completely. But I repeat, this is the only possible non-biblical mention of the man rather than the movement. I’ve kind of lost track where I said what, but by denying that Jesus lived, the burden of proof shifts to you to explain how Christianity came about if there was no human who came to be called “the Christ”. And that is not frivolous on my part. Without Jesus, you have to posit some sort of conspiracy by his followers. The only problem with that is that there was a number of different interpretations of Jesus. The Gospel of Thomas, from the Nag Hammadi scrolls, casts Jesus as a Gnostic. There is a lot of overlap between Thomas and the canonical gospels, but there are significant differences, too. The Nag Hammadi scrolls are a completely independent source; they are not Christian. And there were other types of Jesus followers who believed things that are very different from what became orthodox Christianity. You have to explain stuff like the Gospel of Thomas, too. Okham’s (or Occam, in the Latinized form) razor says that the simplest explanation is the best, and the most likely. As such, the simplest explanation for the eventual rise of Christianity–and all the deviant forms that were crushed out by the orthodox strain–is that there was a Jesus, who taught a message that was interpreted in different ways by different people. It may or may not have resembled current orthodoxy. In all of this you have to bear in mind that two full generations passed before the gospels were written. That is certainly enough time for the legend of Jesus to grow, to morph, and to mutate. That is enough time for him to come to be considered divine. If you read Mark (the earliest gospel) closely, you will find places where Jesus’ divinity is very, very ambiguous. He does not become the full-blown Son of God until Matthew, who wrote about fifteen years after Mark. This is what I mean about the historical process. If you read the NT carefully, you can see how the belief developed. I get it that you’re annoyed with claims made by Christians. Fine. Believe or don’t believe. Just keep in mind that when you are talking about the historicity of Jesus, you may not exactly know what you’re talking about. To stick with my analogy, he left a pretty strong gravitational field in his wake. I believe it’s Ockham’s Razor, for Willliam of Ockham. How Christianity came about if there was no real “Jesus of Nazareth”, a man who did not miracles and was not a messiah that fulfilled the Jewish prophecies? That’s not terribly hard, JBOJ. Well, let me ask you a question: how did the ancient Egyptian religion with Amon-Re, Isis, Osiris, Horus, Sekhmet, etc come about with no gods to start it? Do we have to have actual people who were thought to be these gods but who had no magical abilities whatsoever? Or can there simply be humans who were creative. I’ll give you an example of what could have happened: a human said that there must be beings like humans but were so very powerful that they could make the storm and the wind and the earthquake. Since humans can’t do such things, it must be something much more powerful. Humans also are wired to look for cause and effect. They knew that they could effect their environment in small ways, so it was no great leap to think that there were beings that were like them but again more powerful. there needed to be no individual human mentioned; a general knowledge of humans can be used as source material. Another human asked does it have a name? In that a fair number of god names are simply descriptors, “he who makes thunder” etc, that’s what they were called. Another humans asks where are these gods what do they look like? Like many gods, they are claimed to either look like us or they are invisible, unable to be seen by humans, living far away so we cannot approach them. Then these claims are put to parchment. Then other humans get the stories and decide, like modern humans, that those first myths weren’t quite right and decide that the gods were “really” like what they think they are. So the stories change, with each side saying that their version is the only “right” one. Since none of these sides can show that they are the only right ones, there is no anchor in reality and the stories change again and again with each new human adding on what they think is the right answer. We have one religion, Christianity, that claims that there was a man/god born of a woman and a god, that did miracles and will save all of humanity. We don’t need a real man, we just need a story. Humans don’t need real humans to build fictional characters from. We have no real person who was Darth Vader nor do we need one. This is the same about Hanuman, or Heracles or Cuchulain. Lots of people believed in them and still do. It seems that you wish to think that ancient humans couldn’t make up things wholesale like we do now. Why would you think that? You are right, the gnostic claims have some similarities to the gospels but are very different in other ways. The Nag Hammadi scrolls are Christian, but Christian Gnostic, not Christian Roman Catholic or Christian Protestant or Christian Eastern Orthodox or Christian Coptic. They are just as Christian as any of the others are. Explaining the gnostic books or the gospel of Thomas is just more humans changing the story to what *they* think is right. There needs to be no “conspiracy”, one just needs a humans who think that they are the only right ones and other humans who will believe them. We need no historical individual kernel at all. We only need to know that there are humans and could be gods to gin up the entire thing. Instead of claiming that it only could be “lord, liar or lunatic” we can also add legend. I’ll try to touch on a few points here that stood out to me. “we have no tomb at all” – red herring as I mentioned previously. “The argument is circular, there has to be a magical Jesus because there is an empty tomb because there is a magical Jesus.” This is an inaccurate caricature. There’s nothing magical about a tomb being empty, or full. No supernatural assumption is required to investigate whether Jesus’ tomb was found empty. For this reason, many non-Christian scholars spend their time attempting to find naturalistic explanations for the empty tomb rather than arguing against what is a fairly strong historical fact. Regarding the appearances of Jesus after his death, this is once again a well-established historical fact. The reason is that no supernatural assumptions are required. We are all (probably) qualified to tell the difference between a living and dead person. The historical evidence we offered shows that people experienced appearances of a living Jesus after his death. How you interpret those appearances (hallucination, conspiracy, evil twin, etc) is another story. Once again, many non-Christian scholars agree that these appearances did occur without yet conceding that they were veridical. Once again, minor differences between eyewitness accounts are to be expected. The major elements are not in dispute. Jesus was alive. Then he died. Then people saw him alive again and the tomb was found empty. Quibbling over how many women at the tomb, or whatever other minor details, does nothing to undercut the central message of the eyewitness testimony: Jesus lived, died, and lived (apparently). You are skeptical that Jesus’ brother James existed? Why? As I read your post, it seems to me that your strategy is the discredit that which would support Jesus’ resurrection just because it does so. What other possible reason could you have to disregard both Christian and non-Christian evidence that Jesus’ brother James lived, led the Jerusalem church, and was killed publically for his testimony concerning his brother? Maybe Josephus is just telling a story… This all happened 2000 years ago. Ancestry.com will not help you out here. If you want to do any history at all, you need to seriously consider the surviving documents we have, not simply demand better historical evidence dogmatically. I think your skepticism in the case of James is eminently unjustified and is best explained by your atheism rather than any semblance of historical best practice. Paul. There is strong evidence that Paul was an enemy of the early church. There is stronger evidence that he was then a key leader in that same church. What caused the radical change? The before and after are not controversial, only the explanation of the transformation. I think that the Christian explanation, that Paul encountered God, is more reasonable than any atheist proposal—that is unless you presuppose atheism. But I strongly suspect that you are indeed presupposing atheism. I naturally have no reason to share your presupposition. No evidence of the 500 witnesses? You use the term “no evidence” rather loosely, perhaps due to your prior aversion towards probabilities. There is certainly some evidence—Paul’s letter of 1 Corinthians! The only question is whether that is a lot of evidence or just a little bit—enough to convince or not enough to convince. Do you think that the resurrection of Jesus is the product of pagan mythology influencing Jesus’ Jewish followers? I think that is quite unlikely. Perhaps it’s logically possible but given the famous Jewish aversion to paganism, why think it’s probable? Perhaps, I suppose, if you assume atheism then the last remaining natural explanation, no matter how improbable, must be the truth. I don’t assume atheism is true and I find the likelihood of pagan influence on Jewish disciples to be extremely low for the reasons SS offers. “Sincerity about a belief does not mean that belief is true, only that they person thinks it is.” Correct. How is that relevant? You draw analogies with various cults and communities of sincerely-wrong believers. I’ve written a post on this – http://bennasmith.wordpress.com/2013/04/07/sincere-or-sincerely-mistaken/. The big idea is that most sincere religious believers are committed to an ideology or theology. Jesus’ first generation disciples were committed to an empirical fact – they had seen Jesus alive. Today, people can testify in court that they saw a victim alive on Tuesday even though the victim was killed on Wednesday. 2000 years ago, the disciples testified that they had seen a victim of crucifixion alive three days after his death. Sincerity concerning an empirical fact—seeing someone alive—is significantly different than sincerity concerning a religious belief such as those you mention. We should treat their testimony just as we would today that of a witness in court claiming to see a victim alive on Tuesday. To do otherwise is to beg the question against the possibility of Jesus’ resurrection. Well put Ben. I also seems rather ridiculous when atheists compare Jesus to Santa Claus. Keep it up. Why is it ridiculous? Please explain the difference…. Santa Claus is a character intended to be fiction and has always been understood as such by mature adults. He is not seriously defended in academic journals, books and media. People do not die for a belief in him. The only people who seriously believe in his existence are young kids (and perhaps a few immature adults). With God and Christianity, on the other hand, there is a substantial body of mature adults who truly believe in his existence. His existence is contended for and debated on the academic and popular level, and there are a great many people who defend the idea he exists. I think the differences are quite apparent. Ah, so you use the excuse that only “mature adults” don’t believe in Santa. Nice, excuse there. I guess that children who believe in Jesus don’t count then ? Jesus Christ, the son of God is also not defended in academic journals. I ask you to show me one instance of an actual academic journal, peer reviewed, and not some propaganda piece that is only read by Christians. We have a possible human kernel that has no magical powers defended as a *possible* source for the claims of a semi-divine being. There is nothing different between you and the “immature adults” you claim that believe in Santa Claus. Your claim that there is a “substantial body of mature adults” is nothing more the popularity fallacy. There’s a lot of people who believe in Mohammed, Krishna, etc, Are those gods as real as yours? Plenty of mature adults are believing in those characters, so what’s your next excuse, SS? And people die for wrong beliefs all of the time. That makes no belief true. We had the People’s Temple, we had hundreds of thousands of Germans who believed Nazi claims were the truth and who died on battlefields. We’ve had Protestants and Catholics dying for what they thought was the truth about their god. If all you have is that people died for your religion making it true, then you have to admit that this makes a lot of very nasty ideas true too. You want examples of apologetics in non-Christian academic journals? Why, there are plenty of times academic journals publish articles defending Christianity. It might not mean the whole journal is devoted to doing so, but it does mean that it exists. They really shouldn’t be hard to find, just find a bunch of philosophy academic journals and search through them. If you want me to give examples, I can. Once again, you took the point I was trying to make a step too far. I was trying to demonstrate that it was pointless trying to compare Jesus to Santa Claus, comparing Jesus and other religions is another matter entirely. There is a huge difference. Okay, what is that “huge difference”? I am always amused when Christians make more baseless claims rather than just posting the journal articles they supposedly have and that I’ve already asked for. Delays, delays…..
I’m sure you found that I did take the point you were trying to make “too far” since I showed just how ridiculous your claims are by using Santa. You can apply my points to other religious figures too. We have Krishna, the Wicca Goddess, Allah and his servant Mohammed, etc. 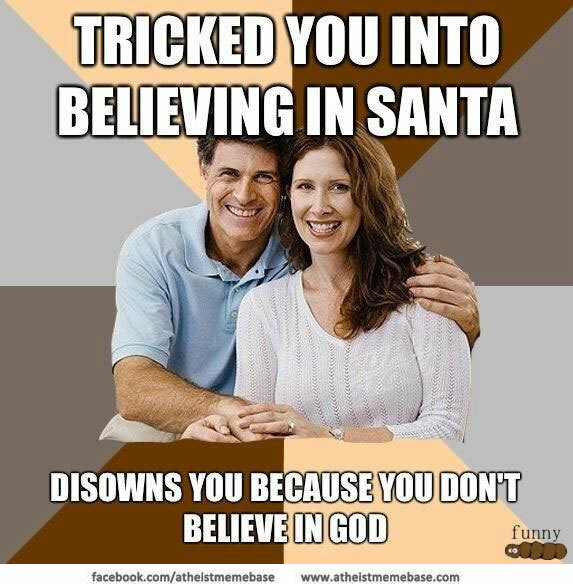 You can put them in for your Christian god and it’s just as ridiculous and Santa is as real as they are. Then we can compare the religions and see just how the same arguments are being used for all of them. I assume you don’t believe in the divinity of Lord Krishna do you? Why not? I’m interested in the well-established historical evidence of people seeing Jesus after he died, and that the tomb found was Jesus’. Unfortunately, search engines didn’t exactly give me nonbiased or non-Bible results- certainly from no doctors of history. And the Bible saying itself is true really means nothing. Kindly articulate the supernatural assumption. I don’t see one. My sympathies for not finding the truth on google immediately. Let’s not be trollish. You assume that the supernatural act that Jesus rose from the dead because people saw him after he died, and that his tomb was empty when it was found. I neither found it immediately, nor on the fifth ‘O’ of “history professor and Jesus’ resurrection”, which is a surprisingly long list of halfway relevant results. But thanks for not pointing me in the right direction, and not giving a lick of that well-established evidence. If you’re interested in this topic I’d recommend Richard Bauckham’s “Jesus: A Very Short Introduction.” Not about the resurrection per se, but helpful to understand what we can know about Jesus historically. There are further references supplied in that book. Otherwise, I’d refer you to the four posts on my blog where the argument is presented and the references in the footnotes. You should be able to find them in the “History” category on my front page menus. You seem to mistake my supernatural conclusion for a supernatural assumption. There’s nothing wrong with entertaining a supernatural conclusion if the evidence supports it (unless you’re an atheist and dogmatically rule them out a priori). We have not assumed the resurrection to be true. Rather, we’ve attempted to provided fairly well supported evidence that points to a supernatural conclusion. we have seen that the empty tomb is evidence for a supernatural event. You have assumed that the resurrection has happened, and that is a supernatural assumption. If you have not, then why do you ignore every other possibility that the tomb never existed, JC never existed or that there was a Jesus, he was cruxified and the body was disposed of by a multitude of regular old events? All of the other ‘evidence’ given for the resurrectin depends on “sincere believers”, assuming Jews can’t think beyond what you assume, etc. Good post boss! Christian apologists are an interesting lot. When hard pressed for evidence which they claim to have, they tell us the evidence is the bible and the bible is evidence that it is true! They must have manufactured the fallacy of circular reasoning, because this is the perfect example of it! Is it your position that the bible does not contain “any” historical evidence? Ben, The Hunt for Red October contains some historical facts (city names, for examples)…. this doesn’t mean its non-fiction. Nice one Ben. Alas, you forget that I’ve already said that there are likely historical events in the bible. There are real places in the bible. Unfortunately, every single special magical event in the bible has nothing to support its occurrence. There is nothing to support a god calling the universe into being and making a man out of dirt and a woman out of a rib. There is no evidence of a world-wide flood. There is no evidence of a tower of babel or a Sodom and Gomorrah being divinely flamed. There is no evidence of an exodus or millions of people wandering around the Sinai for 40 years. There is no evidence of the genocides that the bible claims to have happened. There is no evidence of the fabulous palaces of Solomon and David or of the first temple that had tons of precious metals supposed in it. There is no evidence of a woman impregnated by a god and that son doing miracles. There is no evidence of this son gathering thousands of men outside of Jerusalem. There is no evidence of an earthquake during the cruxifiction, the sun going dark or the dead walking. There is no evidence of a further earthquake happening after the cruxifiction. Were there likely battles that the Israelites were in? Sure. Were they taken to Babylon? Seems to be. But the other stuff, na-da. I find it just great that you say that there is nothing magical about an empty tomb. Nope, there is nothing magical about that at all. However, you and SS have claimed that the empty tomb is evidence of Jesus Christ’s resurrection, and that does require magic. Unless you wish to admit that the resurrection never happened? Do you? Then we can agree that an empty tomb can be come about by many ways that are not magical at all. That would fit your “no supernatural assumption is required to investigate whether Jesus’ tomb was found empty. But you do make that assumption, Ben, because you say that there is *no* other way for it to have happened. And that we have no tomb at all is not a red herring. As Inigo Montoya said “You keep using that word. I do not think it means what you think it means.” A red herring is a fallacy that attempts to distract from an issue. Since the empty tomb is what is claimed as evidence of JC’s resurrection, it is not a red herring since that is what we are talking about. To know a tomb was empty or is empty, one must have a tomb. Another way to put it is that to know that there is a cat in a box, one has to have a box. In this case, we know that the cat cannot disappear from the box. We have magic invoked to get JC to disappear. Same goes with what is a fact. The claim that Jesus Christ rose from the dead and left an empty tomb is not a fact, Ben. A fact is something that can be demonstrated as having occurred or having existed. For example, apples fall because of gravity is a fact. There are no demons dragging apples down. There can be empty tombs since we know this occurs since there are empty tombs; we do not know that people disappear from them magically as a fact. Again, it is not a fact that Jesus Christ the son of god appeared to anyone after his death, even if he existed in the first place as a wandering rabbi. Again, facts are demonstrable. You have *one* book that claims this to be true and no evidence. I find it absolutely hilarious that you claim that “no supernatural assumptions are required” to say that a man who was killed was up walking around meeting people three days after he died. That does have me laughing out loud. If this is so Ben, tell me the non-supernatural reasons that a man could do this? Ah, I see that you mention hallucinations, conspiracy, evil twin. Seems you’ve left out that it could have been just a story and that *no one* saw him after his death. There needs to be no actual wandering around of a dead man at all. And “verdical”? Nice word. Alas you aren’t ‘verdica l” when you claim “many non-Christian scholars agree that these appearances did occur.” Please provide examples of these scholars and what they have said. And no, minor differences between eyewitnesses aren’t always to be expected. The major elements are in dispute and have yet to be shown as any more than legends. So, we also have no evidence that there was a man/god, that he was alive, that he died or that anyone supposedly saw him alive again or that there was a tomb or that it was foun empty from magical means. Demonstrating that the gospels are faulty in very important instances demonstrates that trusting any of it with no evidence is a problem. Let me ask you Ben, if I said that I had a dragon in my garage? Would you believe me? Now, what if I said that I fed it my next door neighbor and you knew this was untrue because you just talked to him? Would one false claim make you doubt my words about even more ridiculous claims? Why or why not? Can you show me that James, the brother of Jesus existed? I’ve yet to see any evidence of this presented other than again one single book and claims by a historian who was reporting what he was told, not what he knew. Where is the evidence that James led any church? And evidence that he was killed publically other than more Christian legends? Ben, I know you aren’t dumb, but here you are wanting me to believe in something that has no evidence and you want me to think that since someone believed in something that makes it true. Again, that makes all gods true then. Why don’t you believe in them? And yes, Ben, “maybe Josephus was just telling a story…” If you can provide evidence I will consider it, but I will not consider it in a vacuum. I have no problem demanding better evidence for your claims. Again, you claim I am not “seriously considering” the claims of the bible aka “the surviving documents” and that is again a lie. History is not just looking at the documents that agree with what you want to believe, Ben. It is looking at everything, artifacts, contemporary documents, myths, legends, asking why if there was supposedly a huge supernatural event or a very technologically advanced city, why is there no notice of it by anyone else in the world and why are there no artifacts from it? You claim that there is “strong evidence” that Paul was an enemy of the early church. What is this evidence, Ben? Where is the evidence that he was a leader in the church? One book doesn’t cut it. You assume that there was a real radical change without considering that the event may have never happened at all and is just a story. The before and after *are* controversial, so please don’t lie and claim that it is not. We have no evidence of your and the bible’s claims. And no there was no evidence of 500 witnesses of JC’s supposed being raised from the dead and walking around. And no, I don’t use the term “no evidence” loosely. There is nothing that supports 1 Corinthians, Ben. That story is the “claim”, not the evidence e.g “I saw aliens in my backyard today” is not evidence, it is only a claim. Evidence would be contemporary accounts by non-believers. I think that the story of the resurrection of Jesus is the product of people who believed in myths and who really wanted to believe in a magical being that was raised from the dead. They may have ginned up the story themselves or they may have borrowed it from the many resurrection myths of the area and era. I don’t care if you think it unlikely, Ben, you need to show why it is unlikely. You have yet to show it is true that your god exists. The Jews did not live in a bubble where they heard of no other religions, Ben. Judaism is also not some unchanging religion. One can see that they had various beliefs, and we know that they knew about other gods and other religions because of the “first” commandment. There is nothing saying that they could not have decided that their god *also* was able to create a part of himself to resurrect to give salvation to everyone. Religions decide that their original beliefs weren’t accurate or complete all of the time. Just look at Christianity and how it has changed what it was sure God had said. Ben, you ask why I have said that sincerity about a belief does not mean that belief is true and how is it relevant? Oh, because you and SS have claimed that the sincereity of the belief of the apostles is evidence that your religion is true. You know, just some silly thing like that. And ah, always nice to see you insist someone is “sincerely wrong” but be unable to show that they are wrong at all. You see, Ben, those you claim are “sincerely mistaken” have just as much evidence as you claim to have and there is no reason to think that you aren’t as “sincerely mistaken” as they are. So what if you are committed to an ideology or theology? It doesn’t make it any better or more true. And you assume that the stories about the disciples are true. The stories say that the disciples believed, nothing more. And it’s rather hysterical that you say that people can testify that they saw someone alive on Tuesday when the person died on Wednesday. Why, yes, they can, Ben. You know why? Because to die on Wednesday, they were evidently alive on Tuesday. But that still doesn’t mean the person existed at *all* if they were a delusion or a lie on the testifier’s part. You have yet to show that JC existence is an empirical fact ( a source of knowledge acquired by means of observation or experimentation)t, Ben, so the claims about someone being “sincere” about seeing him is moot. We cannot treat a set of stories written by unknown authors that have no external evidence supporting them as a witness in a modern criminal case. We cannot interview the authors. We cannot visit the scene of the crime. We cannot look at physical evidence. At best we can consider the stories, and compare them against what evidence we do have. And one book about those stories is not evidence, again it is the claim. You have claimed that Jesus Christ rose from the dead, and the evidence you have cited is the book that claims that Jesus rose from the dead. 1. You regularly confuse supernatural assumption with supernatural conclusion. Much of what you claim rests on this error. 2. You require that “Evidence would be contemporary accounts by non-believers.” This is unwarranted. What if those who saw the evidence were convinced? They would, of course, no longer be unbelievers (i.e. James and Paul). But then their evidence would no longer count on your criterion. Your criterion immediately disqualifies evidence strong enough to convince. No wonder you complain of “no evidence”. 3. “I think that the story of the resurrection of Jesus is the product of people who believed in myths and who really wanted to believe in a magical being that was raised from the dead.” I’m truly glad to have this on the table. Perhaps you can do some work defending this claim. I see no reason to believe it apart from a prior commitment to atheism (which I do not share). I need reasons to take this claim seriously. I suspect your reasons are wanting (but I could be wrong since I haven’t noticed them yet). 4. People testify in court all the time that so and so was either alive or dead on a given day. Based on that evidence (which we take as trustworthy normally), we conclude that someone was murdered. The case for the resurrection is no different. There is testimonial evidence that Jesus was alive, then dead (a murder), and then alive again. Only an anti-supernatural bias can prevent one from taking day to day dead vs. alive evidence seriously. This bias against the possibility of a supernatural resurrection clouds your judgement of what would otherwise be everyday reliable testimony. 5. You suggest that the bible is “one source”. Not true. Within the New Testament we have multiple independent sources (and I’m not talking about different books). Historical biblical criticism shows that there are many independent authors and sources, even sometimes within the same book. For example, Luke includes material derived from Mark, Q (perhaps), and its own original material. 1. demonstrate this. I have no idea what you are talking about. 2. You have claimed that your god and JC wish to not “force” people to believe in it/them. Thus, there should be some people who saw the supposed miracles and didn’t believe. Or do you agree that miracles are to force belief? 3. Why should people not want to believe that something good will happen to them when they die? Most religions have an afterlife, wanting to believe is nothing special. Unless of course, you want to claim that belief in an afterlife is evidence of the validity of a religion? Then yours is not alone in truthfulness. 4.. Yep, people testify that others were alive in court. This aliveness on one day is not evidence for murder. It is presented as evidence that murder had not been committed at that time. Being alive and then dead, is not evidence for a resurrection. Your book has claimed that Jesus was alive again, again that is not evidence that is a claim. And why yes, I do have a “bias” against supernatural claims since NONE of them have been shown to be true. I’m sure you have the same claims when not involving your particular religion. Do you believe that the icons of the hindu gods drink milk? Why or why not? I do not believe that they do because there is no evidence support it other than testimonials from believers. Ben, you are biased against other religions, so that clouds your judgement against everyday reliable testimony! 5. No, Ben, you have one source, put together by church fathers. They put in what they wanted and ignored any thing that did not fit their version of Christianity. We have no idea who the authors were and thus have little idea who wrote the thing. We think we can see certain writers repeatedly, like the author of Luke and Acts, of Paul and some of his letter but not all of them. Most are totally unknown. But since you claim it, who are these “multiple independent sources” in the New Testments (and as you said, not books). As for Q, yes, it may be a source that is seen in most, if not all, of the gospels. So we have cribbing in the gospels from a unknown source “Q”, each other, and even less independent material than before. Thanks for reminding me. Still no external contemporary sources, Ben. Still no one noticing all of those magical events in the bible when they happened, just copying from each other decades after those supposed events. 1. The resurrection argument starts with natural facts (empty tomb, unexplained appearances, sincere belief) and argues to a supernatural conclusion, the resurrection of Jesus. One does not assume that these facts have a supernatural explanation a priori. Neither does one rule it out. Care must be taken to avoid allowing one’s desired explanation (supernatural or natural in mine and your cases respectively) to skew what evidence is permitted on the table for examination. We have not accepted these lines of evidence just because they support the resurrection. They have independent warrant. 2. You have not really addressed my complaint. On your criterion for acceptable evidence, the best evidence is dismissed by definition. Therefore your criterion is biased. Nevertheless, you ask whether anyone saw the evidence and doubted. Yes! Matt 28:17 “When they saw him, they worshiped him; but some doubted.” Also we have many “status quo” religious leaders witnessing miracles in the Gospels. They attribute Jesus’ power to Satan. Skepticism is normal for people, even when faced with true evidence. 3. You defend your theory of the resurrection myth essentially by saying “why not?”. Specifically, “Why should people not want to believe that something good will happen to them when they die?” This is not a good argument. I think I’m going to win a medal in philosophy. You ask why? Well, it’s possible. Therefore it will happen! You get the point. 4. Let me try to explain this again. The evidence for a murder is very similar to the evidence for a resurrection. The only difference is the order of the events. For a murder, so and so is seen alive one day and seen dead the next. If the best explanation is murder then we draw the conclusion. For a resurrection, so and so is seen dead one day and seen alive the next. If the best explanation is a resurrection then we draw the conclusion. The only real difference is that we rarely ever find evidence for a resurrection while we often find evidence for murder. Which is stronger, the case for Jesus’ murder or the case for his resurrection? Why is one so much more difficult (emotionally) to believe than the other? Anti-supernatural bias. 5. You present your own myth of the origin of the bible: “you have one source, put together by church fathers. They put in what they wanted and ignored any thing that did not fit their version of Christianity” This strikes me as atheist folklore developed out of a desire to support their own (anti)religious position. Does that assessment bother you? It should. That’s because its a weak attempt at explaining away the inconvenient. Two can play this game. 1. No, Ben, the resurrection argument starts with the assumption that there was a man/god that could have left a tomb empty by a magical resurrection. If there is no assumption that this character existed, then there is no need to assume an empty tomb since there would be no need of one since there would be no demigod to be killed for what he supposedly did. If this story starts with a man who did no magic at all, then we have many different ways a tomb could be empty without needing magic at all. 2. Ben, the evidence you find as “best” is thrown out for good reason. 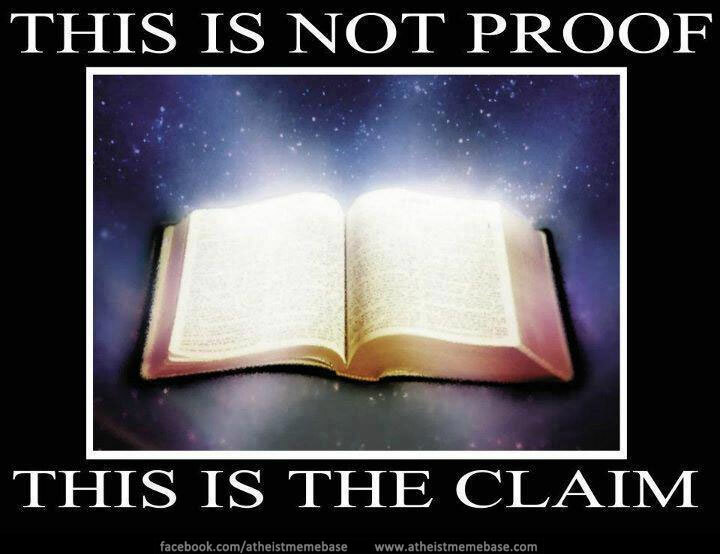 You have the claims of one book that have nothing else to support them. Hearsay is not considered good evidence in a court of law, so I have no reason to think that people telling stories 2000+ years ago would suddenly become good evidence just to make Christians happy. We have no evidence of “status quo religious leaders” witnessing anything, only hearsay. It doesn’t matter if they are claimed to have said the magic was from Satan rather than from God if no magic can be shown to have ever taken place. Skeptisicm is definitely normal for people, but you have yet to show that anyone saw any “true evidence”. 3. Sigh. Ben, you need to show why my argument that people like to believe in things that might benefit them is “not a good argument”. You need to show why. Your attempt at an analogy fails because I can show that people do have this tendency, I do not have to claim “it’s possible”. Humans love to believe in things that are claimed to benefit them with no evidence. Witness homeopathy and astrology. Both terrible failures but people claim that they work. 4. The evidence in a murder is not “very similar” the evidence you have claimed for your supposed resurrection. We have a claim that a man rose from the dead three days after he died publically. We have no evidence for this claim other than stories told about how he was seen by others. You claim that the best answer for these claims is that this man really was magically resurrected and that there could be no other answer but that he was really the son of God and thus of course was magical and wouldn’t stay dead. Now, Elvis died and was claimed to have been seen all over the place after he was dead. Does this mean that Elvis was magically resurrected? It should be the logical answer according to your claims. However, this claim doesn’t make much sense unless we initially assume that Elvis was a demigod. Was he? If you claim that Elvis wasn’t resurrected, isn’t that a bit of “anti-supernatural bias”? The case for a murder is vastly stronger than the case for magic. Murder happens all of the time, an event with 100% possibility since it does happen. Magical resurrection has no evidence that it ever happened, a likely 0% possibility. It is not harder to believe “emotionally”, it is harder to believe in because of known laws of physics. Being alive requires chemical reactions. There is nothing that shows that these reactions magically start up again or that they make the body disappear. I’m also glad to note that you have yet to answer if your disbelief in the supposed miracles of other religion is unjustified “anti-supernatural bias”. 5. I do like that you think it’s a myth that church fathers put together the bible as they saw fit, leaving out parts they did not like. I do think you need to actually read the history of your bible. We have a bible that has various numbers of books depending on the Christians involved. Now, how can this be if there was no one deciding on which ones to keep and which ones to leave out? We have 66 for Protestants, 72 for Catholics, 81 for Ethiopian Christians. It may strike you anyway you like but reality shows that your claim of “atheist folklore” is untrue. Nothing you say bothers me, Ben. I already know you are wrong in so many things, one more isn’t anything special. You are the only one who is indulging in weak attempts at explaining away the inconvenient. I’ll have to firmly disagree with your last three points. 3. To be skeptical of a resurrection myth should be natural because there are so many that no one believes in. You don’t believe in any that goes against the god you worship, right? Why should yours be any more convincing than the many others of ancients times and the present? 4. That difference is terribly crucial. It’s easier to prove that someone was alive one day before they died because 1) duh and 2) there would be evidence of a disappearance/a body that everyone could experience- you, me, grandma. Even then, someone could lie about seeing someone alive on Tuesday, because they killed them Monday night and wanted to throw the trail off- but that’s getting besides the point. Resurrection, however, requires more evidence because someone can easily lie about seeing someone alive after they had died. And one could not prove them wrong, though they will still experience the disappearance as if they were dead. For murder, all you need is a disappearance or a body. For a resurrection, you need that person back. If not, why don’t you believe in any other religious resurrection stories? An anti-not-your-religion bias? 5. What you said to this “They put in what they wanted and ignored any thing that did not fit their version of Christianity” had me feeling that you didn’t believe that was true. Is that correct? What other origin does the Bible have? It seems that, once again, my arguments are once again dealt with with lovely, er, flavour. Perhaps I shouldn’t be writing this, me being “willfully ignorant” and all. Still, a few things must be said about this, both broadly and specifically. A common argument found in this blog post is that none of this that I cited is “evidence”, apparently it is just stories. I find this interesting. By this kind of logic, pretty much all of ancient history can be discounted because, after all, they are just “stories”. I must ask, what differentiates “stories” from actual “reports” from that time period? On what basis are the various things I cite here, from the empty tomb to the conversion of Paul, only just “stories” as opposed to presumably accurate pagan accounts from that time. Doing so would be helpful to both me and the audience. I must also clarify concerning contradictions. As noted before, it is extremely rare for there not to be contradictions between different accounts of the same event. It can be in history (Crossing of the Alps, Great Fire of Rome and sinking of the Titanic all possess numerous contradictions) or today in any court of law. Does that mean, say, Hannibal didn’t cross the Alps? Rome didn’t burn? The Titanic didn’t sink? Hardly, when the difference are just in the minor details, the major ones (such as, say, the tomb was found empty) are still the same throughout. And Vel is mistaken when she says contradictions between testimonies invalidate them. Observe. “Do not automatically reject testimony because of inconsistencies or conflicts. Consider whether the differences are important or not. People sometimes honestly forget things or make mistakes about what they remember. Also, two people may witness the same event yet see or hear it differently” (Section 105, Judicial Council of California Criminal Jury Instructions, 2006). Now to move to specifics. Vel starts by arguing that James never existed. One thing I wonder when reading that. What exactly is good enough evidence that an ancient character existed? The analogy to Horus is useless. For one, James the brother of Jesus is reported in works of non-fiction, such as Josephus’s passage when he refers to his death (which almost all scholars observe as genuine), and in the Epistles. Paul refers to talking with James, and James is reported doing various deeds in the Acts of the Apostles. If that isn’t proof enough James didn’t exist, then nothing, simply nothing, will convince her or anyone else. Vel then goes on to say that Paul never converted, that the only reports we have are, once again, “stories”. Luke, who wrote Acts, was a travelling companion of Paul, so he would have been able to get his information first hand. And Paul refers numerous times to his conversion experience numerous times in his letters. We have accounts written by Paul himself, that is about as close to evidence as you can get. But, once again, sometimes nothing is good enough. Concerning whether the disciples expected his death, Vel quotes Scripture where Jesus predicts his death. One thing I notice is that all of these citations fail to include the key phrase “But they did not understand what he was saying.” That accompanies most of the predictions. And one must ask, if the disciples really did expect Jesus to rise from the dead, why were they cowering in fear? If they really did expect him to rise again, they wouldn’t hide in fear of the Roman authorities, they probably would simply be standing by and awaiting further orders. Indeed, it came as a great shock to them when Jesus did appear to them, and we do read that many (most famously Thomas) were quite skeptical before they believed. And once again, we come to the realm of dying and rising Gods. Once again, there are many things to be kept in mind. First, these myths of dying and rising Gods never really took off in Palestine, most of these mystery religions only start to make an appearance after the destruction of the Temple. Second, though there are some parallels, there are some obvious differences. Heracles travels to the world of the dead (without dying), but then returns. But when he dies, he is dead for good. Third, why would anyone associate Jesus with these people? There are loads of failed messiah’s at that time, the usual reaction when one died was to give up or to wait until the next Messiah came along, so what made the Disciples think Jesus was so special? Fourth, and probably most importantly, if one looks hard enough one will inevitably find parallels to anything. It would not be surprising if there were myths like that floating around, but the mere existence of a myth does not imply the disciples copied it, one must show a connection from the myth to Jesus. With the claim about martyrdom, we have a severe misunderstanding. Vel is correct when she says that sincerity of a belief does not make it true, but all this means is this. It is highly unlikely the disciples would live a life of suffering and martyrdom if all they preached was a lie, they had absolutely nothing to gain from preaching it. This fact cuts the claim that the disciples deliberately made up the whole thing, for while people will die for what they believe is true, no-one will die for a known lie. And one more thing needs to be clarified. Vel assumes I am just another “Craig fan-boy”, and claims that I used his arguments in my case. To some extent, this is true. But Craig isn’t the only one who utilizes those same arguments, many others (Sean McDowell, N.T. Wright, Gary Habermas, Mike Licona, etc) use these same facts as well. I have already stated most of my work can be credited to Charles Foster and his book “The Jesus Inquest”, but of course one just assumes I used Dr. Craig in my work. There are three things you never mention in a discussion with an atheist, and those things are the word “faith”, Pascal’s Wager and William Lane Craig. I usually don’t use Dr. Craig in a debate with an atheist because it brings a bad reputation. So no, I did not plagiarize Dr. Craig. I’ll get back to this next week, but to clarify, what I consider stories claims of the extraordinary that have no evidence to support them. Thus, the claims of Jesus Christ, the claims of Poseidon and Athena contesting over who got to name the city that became Athens, the greek gods beign on the battlefields of Troy, Quetzalcoatl sailing away from the ancient Americas, are all stories e.g. myths. Reports from the past would be those that are not extraordinary claims and that have artifacts, contemporary reports from other sources, etc. And yes, SS, I have called you willfully ignorant. That is giving you the benefit of the doubt that you may actually know about some things but intentionally choose not to mention them in order to make your religion seem more valid. Your analysis of your religion shows that you either do not know or do not wish to acknowledge information that shows your claims to be wrong or that you know much, if anything, about other religions. If you’d like to assume you are simply ignorant, I can do that too. I’ll return next week. others are more than welcome to keep up the discussion. If I may be so audacious, I must ask. Let’s suppose there really was a miracle back in those days. And let’s suppose we can know it to be true through the historical method. What evidence would be sufficient for you to accept it as true? Miracles should, in my opinion, be observed on a case by case basis. It is my opinion that no miracle is better documented than the Resurrection of Jesus, though if one has a better candidate, feel free to bring it up. Of course, natural explanations should be preferred, nonetheless they must be within reason. That is, if one gives an extremely improbably natural explanation to explain away the Resurrection just to avoid a miracle, we have a problem. You have called me willfully ignorant. Now who is making the baseless claims? You have no idea who I am, what my background is, and of my current education level. And yet you assume that me, being a Christian, must be willfully ignorant. It’s called stereotyping, and it’s not impressive. If you believe me of my being “willfully ignorant”, then demonstrate it. The fact is, Christians and atheists are all people. As a whole, neither camp is necessarily more superior intellectually, physically or morally. There is a great article that shows my point. If I were you, I would not be so quick to judge me. Well, let’s take a miracle claimed to have happened in the bible. How about when the “saints” rose from their graves and walked among the living in Jerusalem and environs? Raising from the dead is always a great miracle. Now, what evidence would support such a claim? Opened graves. Mention in contemporary sources, since I’d think that the Romans would notice. One thing would be a rebellion by the Jews since they suddenly have their generals and patriarchs back with them. Reburial if this was a short-lived phenomenon. So, where are all of these things if this actually happened as your bible claims it did? If a explanation is natural then it is not that improbable, SS. Would you agree that you are using “natural” as in that something has happened before with no supernatural assistance? Is it “extremely improbable” that someone made up stories like humans do all of the time, or is it more improbable that a magical being existed, did magic, was killed and then was reanimated all with no evidence and no notice? I have called you willfully ignorant and I have demonstrated it (I will do so again in my next blog post). You have shown that you either know little of or choose to ignore other religions and how they demonstrate that yours is nothing special. Please do show how my claims are “baseless”. I do not need to know your education or background, I only need to read what you have written to evaluate that. What about your background would make a difference, SS? What about your education? It is not stereotyping if I can show you do exactly what I claim. Not all Christians are willfully ignorant, only some who have demonstrated it themselves. But nice attempt to try to create a strawman argument. Christians and atheists are indeed people. And golly, we have a lot of similarities. So? That doesn’t mean you aren’t wrong. You are not me, SS, and I’m rather happy about that. I have no problem in judging you by the evidence you supply. OK, I am going to try this once more. I have now lost two long comment posts attempting to explain my position. I only have so much time, so it’d third time lucky or it’s no go. Here’s the thing: it’s not enough to say the evidence is not convincing. That’s simply a negative. You also have to come up with an explanation for the evidence that does exist, and there is evidence. First, Jesus was dated to a very narrow time frame: somewhere at the end of the reign of Herod the Great, and the governorship (let’s not quibble about exact titles) of Qurinius. Both of these individuals have left traces in other, non-biblical sources, so we can take them as historical. Herod’s reign and Quirinius’ governorship did not overlap. This puts Jesus’ birth somewhere within 5 years of what became the year One CE. That is a fairly close date for something that did not happen in Rome or one of the major cities. And yet, it’s just off enough to indicate that people weren’t exactly sure of the date, which is to be expected. The historical literature is full of arguments about early vs. late dates. So, if you’re going to invent someone, why have different stories? Why not create a consistent story? Second, there are additional governors named in Acts. They, too, are attested in other sources, so they, too, appear to be historical. Jesus’ death occurred at some point before they were in office, so that sets a terminus ante quem for Jesus’ death. Anywhere up to about 40/45 CE would work. So we have Jesus pinned down to about a fifty year period. Again, that is fairly precise. There are a lot of, say, literary types that we can only pin down to this level of accuracy. Now, if you’re going to invent someone, why pin him down to a time when there would be people alive who could debunk the claim? No mythical figure has ever been pinned down to such a specific place and time. Herakles, or Theseus, or Orestes are not even close to being analogous. They all simply lived ‘a long time ago’. In the ancient world, nothing conferred credibility like antiquity. If I were living then, and I wanted to start a new religion, I would claim to have discovered a scroll that was a thousand years old. This would have given me instant credibility; or, at least, it would have gotten me a listen. That would have been a much better story than some guy who was executed as a common criminal ten years ago. That makes no sense at all, and yet Jesus’ execution was part of the story from the beginning. Next, there is the dispute between Paul and James, the brother of Jesus. Now, we don’t know that James was Jesus’ brother; there is no independent corroboration of this. However, Paul accepts this relationship without any quibble. Now, Paul became engaged in a dispute with James, but he readily conceded James’ relationship to Jesus. This puts Paul at a disadvantage. Why does Paul not deny the relationship if he had any suspicions? Why not say, ‘James, who claimed to be the brother of Jesus’? And again, if you are going to invent Jesus, why go to the trouble of inventing this dispute? What good does it serve? This dispute occurred within a generation of Jesus’ apparent death. This indicates that there were disagreements that occurred fairly soon after Jesus’ supposedly died. If you’re inventing a story, wouldn’t you have a bit more control over the content? Rather, this sounds like a real person died without leaving a clear successor, so we got a split comparable to the Sunni and the Shi’a. And how big was this conspiracy that got this started? That’s a very important question. Was it one person? Ten? Was Paul part of it? Then why the argument with James? Why admit that they disagreed? And how does a conspiracy make more sense than a movement started by a charismatic individual? What about Diogenes the Cynic? He lived his life, and others imitated him. Why? Because they were impressed by his devotion. So, if people wanted to follow the teachings of Jesus, what does that say about Jesus? At some point, there almost had to be a charismatic individual spreading the tale. Whether this was Jesus, or the guy(s) who invented Jesus. Now, if I were to go around preaching, why tell everyone about someone else, especially when that someone else was executed by the Romans? Why not claim I have the message? Because the messenger was too humble to take credit himself? Sure, there have been lots of charismatic individuals over the last 2,000 with that level of humility. To have inspired a movement that spread the way it did in fifty years means that, not only was the message powerful, but so were the messengers. The scenario most likely fitting this is a single individual who inspired a handful–or more–of new individuals who were inspired by Jesus, just as all those latter-day Cynics followed the example of Diogenes. So, again, you have to come up with a very compelling reason to explain why someone would take the trouble to invent a third party, especially a third party who had as many strikes against him as the story of Jesus did. Finally, you need to read Mark. This was the first gospel written. Paul was writing letters to assemblies that he’d started, and the letters seem consistent with what they claim to be. Mark was self-consciously writing–or compiling, or editing–a story from the different oral traditions–with possibly some written traditions–that came down to him. However, if you read closely, you will see that Mark is, in places, ambiguous about whether Jesus was really divine. There are hints that Mark did not believe this. Matthew and Luke believed this fully. This indicates that the story changed with time. The person of Jesus was gradually made into a divine individual, but only gradually. If you’re inventing a magical Jesus, why wasn’t he magical from the start? Look, I said in my first comment that there is no smoking-gun evidence, either to prove or disprove that there was a Jesus. Conclusive proof simply doesn’t exist. But, IMHO, the evidence that exists tends to support that someone like Jesus did live. The idea that someone went to all the time and trouble to invent Jesus is, IMO, rather bizarre. I really can’t think of an example of someone being invented like that. I am making no claims about the factual accuracy of any statements made about Jesus by any of his followers. I am simply saying that an historical figure–someone who lived and died and stayed dead–stands at the beginning of what came to be Christianity. He taught people, they listened, they liked what they heard, and fifty years later they made him divine. Just like they made Julius and Augustus divine. This was not a novel thing back then, and certainly was not unique to Jesus. So, your turn. Tell me a story that accounts for all of these points. I’ll address this in a day or two. One helpful tip: write your response in a word processing program and cut and paste into comments. people have created characters in stories where there are real people and real places mentioned. It’s nothing new. OK,, I reviewed the evidence. You’re not convinced . Fine. But you still have to convince me that it makes more sense, logically, that someone made Jesus up rather than that Jesus was a real person. You need to explain how that came about, and in such a way that it takes the available evidence, such as it is, into account and provides a reasonable explanation about why this ‘evidence’ exists. I don’t *have* to do anything you command. It does entertain me to do this again since you have yet to support your accusations about me. I have set out my arguments. Your approval on what you consider “reasonable” and “logical”is not needed. I have already shown you a plausible scenario that accounts for the myth of Jesus Christ. I have shown you why I don’t find your evidence convincing repeatedly as anyone who has read our interchange can see despite your false claims otherwise. You have demonstrated that you only want to ignore the problems with your claims e.g. “let’s not quibble about exact titles” As I have said before, it is nothing new to humanity to invent stories that mention real places and real people. The fact that some people and some places are historical does nothing to support the claims of the historical existence of your Jesus Christ, or Poseidon and Athena at Athens or the gods at Troy. As I understand it, we can date Troy to some accuracy when events of the Iliad are thought to have occurred. Does this mean that there was an Achilles, son of Thetis, there? There were certainly warriors but we don’t seem to find an actual historical Achilles. All I see in your claim is that since the myth of Jesus is relatively recent it must be historical, is that you ignore the possibilities that other figures could be just as historical but we have lost the information simply because it is convenient for you to support one supposed charismatic character and not another. We have plenty of people who did not believe in the stories claimed about Jesus contemporarily, people who did debunk the claim. They are called Jews. I find your claim that “nothing conferred credibility like antiquity” to be true but perhaps not in the way you intended. There is no “new religion” being started, only the adjustment of Judaism. There is plenty of appealing to “ancient writings” aka the Old Testament, appeals to supposed prophecy. That execution was supposedly also prophecied. The dispute between sects of religions is nothing new. Paul and James have competing claims and as always both claims appear to have nothing to support them. I can postulate that Paul needed to support James for some reason, much the same way that opposing leaders of sects now support each other when convenient. However we have no evidence to support your opinion or mine. Inventing a dispute makes for an us and them, always useful for those who want to lead people. This could indeed sound like a real person who died without leaving a clear successor, and it can also sound like stories from people who thought there was a Jesus Christ, wanted to claim how close they were to him and declared themselves the one true heir. Again, we do not need a single historical figure to accomplish this. Again, you try to claim that there was some intentional conspiracy, your strawman of two guys in a bar. I have explained how one is not needed and how that it makes as much sense as a movement started by one charismatic individual. I do not recall anyone claiming Diogenes being magical. If a person can claim that they got the magical truth from a source that was magical and now is unavailable, it is hard for an ignorant populace to disprove him. If his message is appealing, that everyone who believes in such a story will get to avoid dying, then they have a reason to not want to disprove him. And JBOJ, I’ve read the gospel of Mark and I have read about the gospel too. I’ve read the entire bible a couple of time straight through and many times in pieces. So again, your insistence that I am still poor “dense” ol’ Vel is ridiculous. As you yourself say, what the author of Mark intends is ambiguous. The story does change with time and again none of this needs a single person to be Joshua Ben Joseph for reasons I have already gone into. Just because you can’t think of another example of someone being invented exactly like Jesus Christ is meaningless. That is only personal incredulity being used as an excuse. You and many Christians seem to want only the “lord, liar, lunatic” argument. I can somewhat understand Christians since they seem to think that if they can just get people to believe in mortal Jesus then they have “won” something. But why a self-proclaimed historian needs to have a singular historical figure is beyond me. I have simply added “legend” and I believe I have supported that as well as you have yours, and I think better since I have not claimed strawmen conspiracies to decry the idea that JC could be an entirely fictional character. OK, we disagree. I’ve set out my position, you’re not convinced, so we disagree. I’m not trying to construct strawman arguments. I’m saying that, if it wasn’t a single individual, then it was more than one. But if you’re saying that it was a single individual not named Jesus, then, that’s fine, too. Basically, I believe the existence of an historical person, named Jesus, preaching in his own name best accounts for all the evidence that we have. You believe it can be accounted for by a person or persons unknown. Is that fair? And, if it wasn’t more than one person in your view, then you believe it was started by a single individual not named Jesus. Is that fair? I see that I made an erroneous assumption in thinking that you were suggesting it was done by more than one person. I apologize for that. One part I don’t understand is why you continue to insist that I’m a Christian. I was raised in the Roman tradition, and we are all culturally Christians, but I do not believe Jesus was any more, nor any less, divine than you or I. I was a Christian, I was an atheist, now I’ve settled into pantheism. I believe that creation can be divine without being supernatural, or without the existence of a transcendent god that is distinct from creation. This is similar to what many pre-agricultural peoples seem to have believed. The other thing I don’t understand is why what I believe matters. We are talking about history. We are not–or I am not–talking about theology. What was said about Jesus by others, whether before or after his death, has no bearing on whether he lived or not. As I have said, divinity was attributed to others we can be reasonably sure were historical. As I see it, that some people believed Jesus was magical does not affect his existence. I apologize if I am drawing another unwarranted inference, but you seem to imply that what other people said about Jesus somehow does matter; when I posited Diogenes as analogous, you said that no one claimed he was magical. OK, how does that bear on whether Diogenes really lived? By this reasoning do we have to disbelieve in Elvis because people saw him after he died? That is what you seem to imply, but perhaps I am misreading, or misunderstanding. And you believe that Herakles or Theseus are analogous to how Jesus was created. I disagree, wholeheartedly. And, yes, something like the event that came to be known as the Trojan War can be dated +/- 50-100 years. I believe that supports my case: there was some sort of real event, around which a shell of myth grew up. This is my position about Jesus: a real man around whom a shell grew. I believe your case is a real man not named Jesus who talked enough about Jesus that the shell grew around this fictitious individual. Is that fair? So anyway, we disagree. Thanks for your time, and fare thee well. Sorry, JBOJ, you have created the strawman argument based on your claim that there was some “conspiracy”. You have claimed that this is what I have claimed and I have not. You have claimed this more than once. It is not a matter of simply disagreeing, it is a matter of you lying about what I have said. You have still got it wrong, in that I do not think any one person started the Jesus myth. Considering how I have repeatedly outlined what I do believe, it seems that you have not read anything I’ve written, again only concentrating on your strawmen since you have not once addressed what I have really said. And again, I have not claimed you are a Christian after you said were not. We are “all” not culturally Christian. I am assuming you are a US citizen the same as me. The US culture is not Christian, though many Christians will try to claim so falsely. If the US was Christian culturally, well, that would depend on how one defines Christian doesn’t it? Are we a theocracy? No. Are we small-C communists like Jesus? No. Do we enforce biblical laws? No. Do we say that Christians shouldn’t be yoked to anyone else? No. Do we define marriage as only one man and one woman and try to kill homosexuals? Not anymore. There is nothing demonstrably “Christian” that the US is. It’s a shame that you find you can leave and ignore my requests for you to demonstrate your accusations. But it is expected. My apologies; I’m posting this to make sure my comment will post. Please excuse the crudeness of the test. OK, my bad. I guess, technically, that doesn’t have to mean that you consider me a Christian. It’s me, and it’s the Christians, but the two categories do not necessarily overlap. However, the common-sense reading of that sentence (fragment) is that you are lumping me with Christians. Second apology: it appears I have been constructing straw-man arguments. But that was because I didn’t believe that you actually take the Osiris/Herakles seriously, so I assumed that you were crediting a group or an individual making yup the stories. Really? You honestly believe that comparing Jesus to Herakles is a legitimate explanation of how Jesus became divine? As I have said, numerous times, those stories of gods and heroes developed over decades, if not centuries. Homer and Hesiod wrote a lot of them down for the first time, but they were hundreds of years old by then. No one claimed to have met people who had known these gods or heroes (outside of a vision), or to have been their brother (except perhaps the pharaoh). The first epistles were written when Jesus was a living memory. That is a radical, game-changing difference in process. Unlike your standard-issue myths, the Jesus story went from zero to widespread in about 50 years. The only comparable analogy would be Islam (cannot speak to Bhuddism or Confusionism). The Arthur stories took centuries to develop. And there is absolutely no evidence of Jesus before Paul’s letters. If you are going to suggest that the Jesus myth developed over a longer period of time, it is necessary to show some sort of evidence for this. And that an event that could have suggested the Trojan War can be dated within 100 years really isn’t the same as saying that Jesus had been born about 50 years before. By the time Homer wrote down the Iliad, centuries had passed. Writing wasn’t introduced into Greece until sometime after 800 BCE. The destruction of Troy VII a (IIRC?) happened sometime before 1150 BCE; 350 years earlier. The Jesus story was written at a time when contemporaries were still alive. I’m sorry, but saying Jesus was comparable to Herakles is just not a serious argument, for the reasons I’ve set out. And when I said “you have to…” I wasn’t issuing commands; you do not have to do anything I say. What I was saying is that, in order to set out a credible hypothesis, the evidence as it exists has to be accounted for. Not why it’s wrong, but why it is. And the ‘lord/liar/lunatic’ argument only pertains to Jesus. Jesus wrote nothing; the stories were written after him; we have no idea what, if anything, actually traces back to him. So how do we get to L/L/L if none of it goes back to Jesus? So Christmas is just another day for you? Don’t know about Easter? Never heard of Noah’s Ark? Or Adam & Eve? Or the Prodigal Son? Those are cultural reference points, perhaps drained or missing the original religious meaning, perhaps not. I said we are ‘cultural’ Christians, not Legal Christians, living by whatever the Christian equivalent of Sharia is. But we don’t work on Sundays (changing, I know) and we go trick or treating (Christian–All Hallows Eve, the night before All Saints Day), and you’ve heard of the concept of walking on water, so…we become cultural Christians, a group that shares a lot of common cultural references. And yes, Christmas is just another day as is Easter, etc. So you’ve failed again, JBOJ. If the US was culturally Christian, then we’d be killing those who work on Sundays. Or, ooh, that is your defninition of “legal Christians”. Sorry, a culture is more than just popular references. You know, “not one jot or tittle of this law” should be ignored until the heavens and earth pass away. If mentions of religion make something “culturally” one religion, then my oh my, we must be Norse since we use Monday, Tuesday, Wednesday, etc. And Halloween aka All Saints day didn’t start as Christian. For a historian, you certainly get easy things wrong.